I have to be honest everyone. I’ve had some serious temptations as of late to spend my money. While I’ve been saving up to pay the tax man, there has been a desire growing inside of me to buy something. Maybe it’s because I’ve been working so hard as of late. Maybe it’s because I just want to reward myself for said hard work. While these are both plausible, I think it comes down the the case of general boredom. Yep, when I’m not working, blogging, managing other blogs, enjoying family time, or getting my DIY on, I do have the tendency to get bored. I have a problem just sitting down and doing nothing, unless it’s a well-deserved nap! Ever since I got my first job, I’ve been on the go. I don’t stop much. It’s just not in my nature. I work hard for what I have and it slowly takes a toll on my finances. I don’t have a problem with saving anymore, but I’ve found that I might be saving too much. I’m not enjoying myself now, so when the time comes, I might go on a little spending binge. These events usually occur when boredom strikes. Luckily for me, these events don’t happen often, but when they do, my wallet feels it. During my latest break from preparing all my tax documents, I stopped by Amazon to see what’s new and what I would like. Well, since I’m a technology guy, it didn’t take me long to find some cool things. While I didn’t actually buy anything from there, I did locate a new computer mouse to replace the junk one that came with my computer. I had a $15 off coupon for Best Buy, so I found the mouse there and saved 50 percent! So, even though I spent, I didn’t do it without finding some savings. The problem is I wouldn’t be spending if I wasn’t bored or tired of doing the same thing over and over. What’s a Good Solution to this boredom? Boredom can affect anyone. As I said, it doesn’t hit me that often, but when it comes, I feel myself tempted to relieve it by spending some money. I typically have buyer’s remorse when it happens, so hopefully I get something I can return! Ever since breaking out of credit card debt, I have used my credit cards to buy stuff. Not because I wanted to get into debt again, but more so to maximize my rewards. I pay off my cards every month. Unfortunately, spending money I didn’t intend because I was bored is not in my budget. At least, it wasn’t. Now it is, but with a twist. I decided to implement a “boredom” allowance for myself. This is strictly cash that I pull out of the ATM on a weekly or monthly basis. If/when I get bored, I dip into this allowance and do my spending. When it’s gone, I’m done. I’ve never been much for a cash budget, but this spending allowance works well for me and keeps me from making money mistakes. It keeps me on budget in other areas and allows me to break away and spend some of my money, just not all of it! If you’re like me and you spend when you get bored, you have to come up with a way to minimize the spending. I go with it from two angles. I work on a lot of things, so I don’t get bored often, but when I do, I use a boredom allowance. This cash account keeps me from spending all of my savings and putting me into some kind of hole. I don’t like digging out of holes. Been there and done that! What about you my friends? 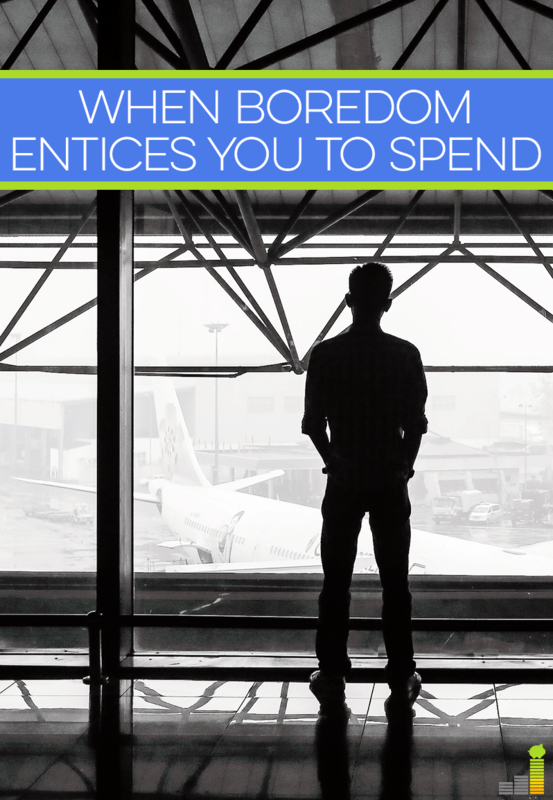 Do you spend more when you’re bored? If so, what’s your purchase of choice? How do you keep yourself from going overboard? I think you did a great job at recognizing an issue and taking action to offset that action before it becomes a bigger problem. Had you not set up a boredom allowance, you could easily fall back into credit card debt. But by using this account as a safeguard, you protect yourself from harm. Yes, sometimes! Like if I am waiting for someone in the mall, I’m pretty sure there’s going to be an impulse buy for me. I have been known to make an occasional late night Amazon purchase because I’m bored. Usually it is something we need, but still. It happens! The kids keep me pretty busy at other times so I don’t splurge much. My tendency for boredom has waned significantly since starting my blog. My spending out of boredom danger zone is when it’s nice out and I’m just strolling around the streets. I just feel like I should get a coffee or an ice cream or lunch. I’m like you–I have a hard time slowing down, so I don’t usually find myself bored (I’m more on the stressed end of the spectrum 🙂 ). But, I absolutely want to spend money when I’m bored/waiting around and my temptation is almost always food. I used to have a habit of buying coffee or a treat anytime I was waiting to meet someone or for an appointment and I’ve had to consciously check myself and just not do it! Packing my own snacks seems to be the key for me :). This is a good point. 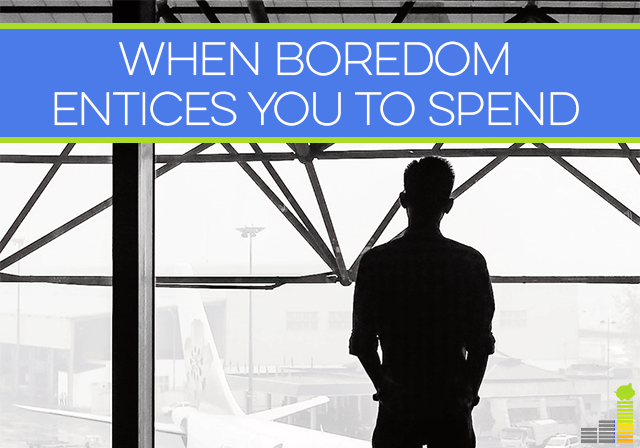 Boredom is one of my primary enemies on the road to financial independence–or at least the road to being really frugal. For me, the biggest challenges are books and video games, because they are easy to buy, instantly delivered, and generally cost less than $15–pocket change! Bigger expenses that tempt me are easy to avoid because I NEVER spend more than $40 or so without consulting with my wife, who does a good job of keeping me in check (and it’s a good thing, too–my more expensive hobbies are pretty darn expensive). 90% of the time, I decide no, and then after a few days pass I decide I didn’t need it after all, and I end up $20 richer and without missing out on anything. I’d love a little boredom in my life right now! 🙂 I actually don’t spend when I’m bored, but have more temptation when I’m feeling low. Like I want that certain “something” to pick my spirits up. “Oooh, this new top should do it!” Or I want to get a massage because I feel like I deserve it. I do think its OK to have wants. You just have to learn how to manage them and think carefully about purchases. But yeah if you have wiggle room with your budget, it’s always a good idea to have some fun money. Sometimes having a bit of free time makes me want to browse a site like Amazon. I try to remind myself that shopping itself bores me, I probably won’t actually buy anything, and I’ll feel much better if I do something I enjoy more, like reading. I like the idea of having some money set aside to blow as needed. I can’t remember the last time I was bored, but I do spend more when I’m stressed. It’s mainly due to convenience because I don’t take the time to search for deals or I’ll get take out because I didn’t plan for a meal. We used to go shopping out of boredom all the time, but thankfully, we have found more productive ways to fill the time. Boredom can get so many people in trouble when it comes to spending. Because what is a better cure than buying something. 🙂 I struggle with this too, but like, I am rarely bored, so that helps! I also have gotten pretty good at identifying when I’m emotional shopping (whether it’s boredom related or not) and can normally stop myself in time. But having money set aside for times like these – when you can spend on things you want guilt-free – is always a good thing. I like to page my way through Amazon some times and I add a lot to my wishlist. Probably not the best frugal habit. I’m happy to say that I don’t spend money when I’m bored. I usually want to go out or something. Most times I force myself to stay in though. Amazon can be REALLY dangerous when I’m bored. Granted, I spend so much time analyzing purchases that I typically don’t actually end up buying anything. I’ve spent well over a year and a half trying to decide whether to buy a tablet or not…and so far haven’t bought one. I do this all the time with my snacking budget. There is usually a $20 I’ll set aside for snacks or other stuff and once that is gone, nothing more until Monday morning. It’s really helped me get a grip on stopping by after work for ‘something small’ everyday. Fortunately for me, I don’t spend when I’m bored. But unfortunately for me(and my waistline), I eat when I’m bored, ha. But seriously, I don’t think anything is wrong as long as you stick to your allowance. You work hard, you deserve to spend and have some enjoyment. That’s one lesson my wife has taught me. Work hard, but enjoy SOME of the fruits and save/invest the rest. Life is for the living. I don’t get bored often either because I usually have more than enough to keep me busy, but when I do try to take a night off from working, I just can’t seem to relax without feeling bored. I think it’s a sign that I have too much going on, haha.